Looking for the QuoteWerks integration to Maximizer CRM Live (Cloud)? From our Sold To / Ship To tab of the QuoteWerks quote workbook, with a simple click of a button, QuoteWerks will fill in the contact information in the quote by pulling the contact information from the contact that is currently selected in Maximizer. You will never have to re-type your customer information. When you select the Maximizer contact to use in the quote, our innovative DataLink feature can automatically pull other information from Maximizer into the quote such as customer terms, customer sales tax rate, customer profile etc. Customer profiles can be used by QuoteWerks to determine the appropriate pricing a particular customer should receive. QuoteWerks has a built-in print layout designer that allows you to customize the look of your quote. 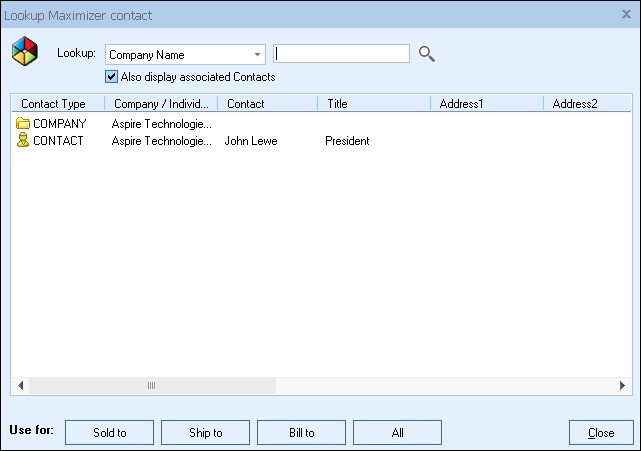 The print layout designer also allows you to easily insert data fields from Maximizer into the QuoteWerks print layout. 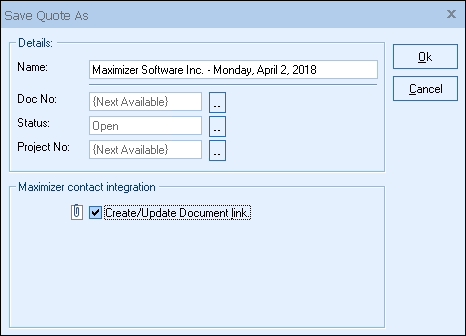 Then, when you print the quote, QuoteWerks will pull data from the Maximizer contact fields that you inserted into the print layout resulting in a printed quote that includes information from your Maximizer contact record. This feature is different from the DataLink feature (described above) in that this extra data is pulled from Maximizer and printed, but not saved with the quote. When you need to save the information pulled from Maximizer into the quote, you would use the DataLink feature. So, for example, if you are using a field in Maximizer to store the contact’s assistant’s name, you can insert that Maximizer field into the print layout so that when the quote is printed, the assistant’s name will be printed on the quote, but not saved with the quote. When saving a quote QuoteWerks automatically creates embeds a document under the Documents tab in Maximizer that links to the quote you are saving. When you are in Maximizer and select the Documents tab, you will see all the quotes that you have done for this Maximizer contact. You can even double-click on the document links, and QuoteWerks will open and display the quote the link refers to. This feature is very useful for organizing and finding your quotes from within Maximizer. In Maximizer 9 and lower QuoteWerks creates a document link rather than embedding the document. QuoteWerks has a built-in e-mail client allowing you to e-mail the quote to your customer with a single-click. Your customer’s e-mail address is automatically pulled from the Maximizer contact information, and after the e-mail has been sent the e-mail is logged in Maximizer history under the Notes tab.